Do you have a hubcap scratched, corroded, dented, or missing altogether? This is a great quality replacement, complete with VW logo, just like the original. Spruce up the look of your ride! It is super common for the clips on stock VW wheels to break or become loose. This kit contains 5 replacement hubcap clips and 5 rivets to use to reinstall them. Don't lose another hubcap! Replace the clips. One kit is will replace them all on one wheel. These chrome hub covers install between the wheel and the brake drum. They cover the old rusty, dirty brake drum and provide a nice finished look. Usually used on off-road cars. Works with popular wheels such as the steel off-road wheels, Centerlines, BTRs, Race Trim, etc. Sold in pairs. Need to adapt your 5-lug early style VW drums to the later 4x130mm VW pattern to fit that custom wheel you need? These adapters are the ticket. Uses your stock lug bolts to hold the adapter to the drum. You'll need to use matching lug nuts for your wheels. Sold in pairs. Need to adapt your 5-lug early style VW drums to the Porsche 5x130 pattern to fit that custom wheel you need? These adapters are the ticket. Uses your stock lug bolts to hold the adapter to the drum. You'll need to use matching lug nuts for your wheels. Sold in pairs. Need to adapt your late style VW drums to the early 5x205mm VW pattern to fit that custom wheel you need? These adapters are the ticket. Uses your stock lug bolts to hold the adapter to the drum. You'll need to use matching lug bolts for your wheels. Sold in pairs. Need to adapt your 4-lug style VW drums to the Porsche 5x130 pattern to fit that custom wheel you need? These adapters are the ticket. Uses your stock lug bolts to hold the adapter to the drum. You'll need to use matching lug nuts for your wheels. Sold in pairs. 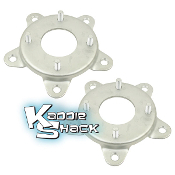 Need a little extra clearance between your wheel and your drum or disc? These spacers will allow you to move the wheel out a bit for extra clearance. Dont forget to order longer studs so you get enough threads on your lug nuts to hold the wheel on safely. 12mm lug bolts have 60 degree taper and designed to fit most EMPI 5 x 205mm wheels and other aftermarket wheels that require a 60 degree taper. 14mm lug bolts have 60 degree taper and designed to fit most EMPI wheels and other aftermarket wheels that require a 60 degree taper. Commonly used on the 4 x 130mm late style wheels, but can also be used on buses, which have the larger 14mm lug pattern on th 5 x 205mm bolt pattern. 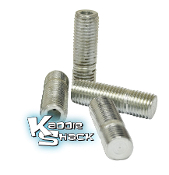 Missing a lug bolt for your '67 or earlier stock Type 1 Wide 5 wheel? This is a replacement. Missing a lug bolt for your '68 $ later stock Type 1 4-lug wheel? This is a replacement. Also fits buses up to 1970 and type 3 '66 and later. Quality acorn style chrome lug nuts fit 12mm studs. Set of 5. Quality acorn style chrome lug nuts fit 14mm studs. Set of 4. Quality acorn style chrome lug nuts fit 1/2" diameter wheel studs with 20 thread pitch. Set of 4. You can have Porsche Style lug nuts that match the 60 degree taper of your EMPI wheels. 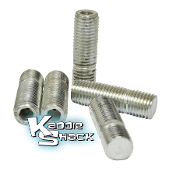 Simply install lug studs in your drums or rotors and use these nuts to secure. Chrome plated steel. These lug nuts are designed to be used with mag wheels or the older wheels such as EMPI, American Racing, American Eagle, etc that require the flat washers to but up against the wheel to hold it on. Be sure to use the correct washers also! They have 1/2" threads. These steel Porsche style lug nuts have the correct taper to fit Porsche wheels, as well as the ball seat EMPI and stock VW wheels. They have 14mm threads and a 19mm hex head. These aluminum alloy Porsche style lug nuts have the correct taper to fit Porsche wheels, as well as the ball seat EMPI and stock VW wheels. They have 14mm threads and a 19mm hex head. These black anodized aluminum alloy Porsche style lug nuts have the correct taper to fit original Porsche wheels, as well as the ball seat EMPI and stock VW wheels. They have 14mm threads and a 19mm hex head. They add a premium look and are super strong. These lug nuts are designed to be used with mag wheels or the older wheels such as EMPI, American Racing, American Eagle, etc that require the flat washers to but up against the wheel to hold it on. Be sure to use the correct washers also! They have 12mm threads. A common mistake we see people do is install their wheels that have the "metric ball seat" taper with "acorn" style lug nuts, which have a straight 60 degree taper. This will damage the wheel, and can cause all sort of havoc. These adapter washers solve that problem. These washers are required with mag wheel style nuts # 9536 and 9538. Sold in packs of 5. 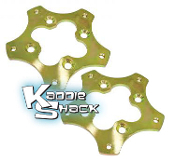 Installing wheel studs in your drums or disc brake rotors makes taking your wheels on and off much easier. 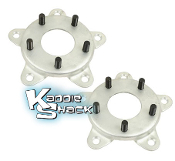 These adapter studs screw into a 14mm drum or disc, and have 1/2" x 20 threads on the other side to install the lug nuts on. No drilling required. 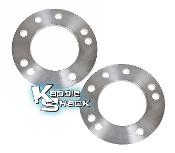 These EXTRA LONG studs are generally used when running wheel spacers to space your wheels out away from the drums or discs. When using spacers, a longer stud is needed in order to get enough threads on the lug nuts to properly secure the wheels. These have 35mm of threads on the wheel side. 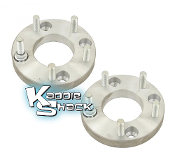 These EXTRA LONG studs are generally used when running wheel spacers to space your wheels out away from the drums or discs. When using spacers, a longer stud is needed in order to get enough threads on the lug nuts to properly secure the wheels. These have 35mm of threads on the wheel side. These EXTRA LONG studs are generally used when running wheel spacers to space your wheels out away from the drums or discs. When using spacers, a longer stud is needed in order to get enough threads on the lug nuts to properly secure the wheels. These have 34mm of threads on the wheel side.